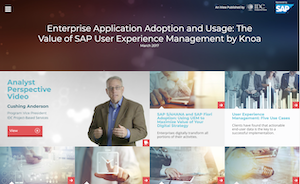 Drive your clients' success with Knoa User Experience Management. Knoa works closely with industry-leading technology resellers, distributors, service providers, and integrators to develop partnerships that create new revenue opportunities. Join our selected partner network, to enable enterprises to transform their business and stay ahead of the competition. With Knoa's unique user analytics platform, you can help organizations embark successfully on digital transformation projects. Drive new business opportunities - work with the market leader in user experience management, to accelerate the business transformation of your clients using our best-in-class technology. Build a comprehensive offering - build complimentary solutions around the Knoa user analytics or support joint clients with technical implementation, enablement, and other consulting services. Cross-selling opportunities - expand the scope and value of your current client initiatives by creating new offerings based on the analytics provided by the Knoa solution. Collaboration on joint marketing initiatives such as webinars, trade shows, press releases, etc. and benefit from our co-marketing funds. Contact us to learn more about the Knoa Partner Program and drive value for your organization and customers with the most advanced user analytics solution.